Happy Birthday on February 1 to Delivery Driver Extraordinaire, Larry Sparks. If you’ve ever had a medication dropped off at your home, you may have been visited by delivery driver, Larry Sparks, who spends many an afternoon hanging out in the giant white van with Joe’s picture on the side. If Larry stops by your house this coming Wednesday, February 1, make sure to tell him to have a wonderful birthday. 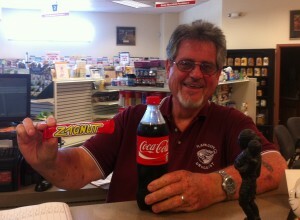 If you are wondering why Larry is holding up a Zagnut candy bar in this picture, it is because Joe has an addiction to these oldies but goodies and Larry was teasing him about it. For his birthday, Joe said he’ll let Larry have a Zagnut, too. As sweet as a candy bar, Larry has been a blessing to us and our customers and we want to wish him the happiest of birthdays. 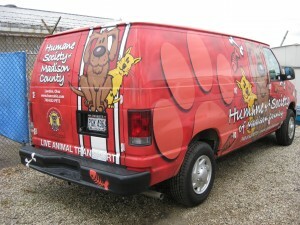 Moving On Up: Humane Society of Madison County is in Their New Home! 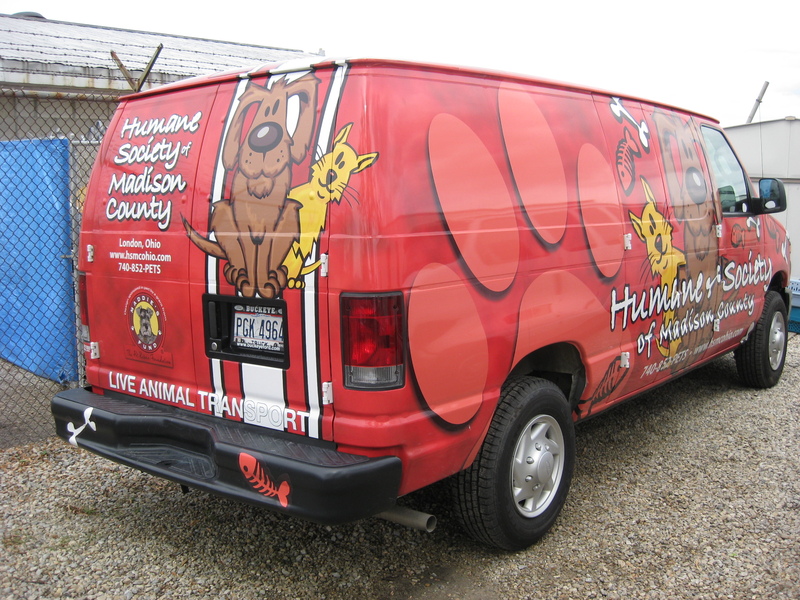 The Humane Society of Madison County (HSMC) is finally in their new expanded building located at 2020 State Route 142 NE, just off of I-70 at the Plain City exit. The new shelter has a West Jefferson address, but is only about 5-10 minutes outside of Plain City. An article in The Madison Press gave some good PR to the shelter. You can read that HERE. And there was also a nice story in the Columbus Messenger. Read that HERE. The shelter does not have a permanent phone number yet. If you need to reach them currently, call 614-359-7560. 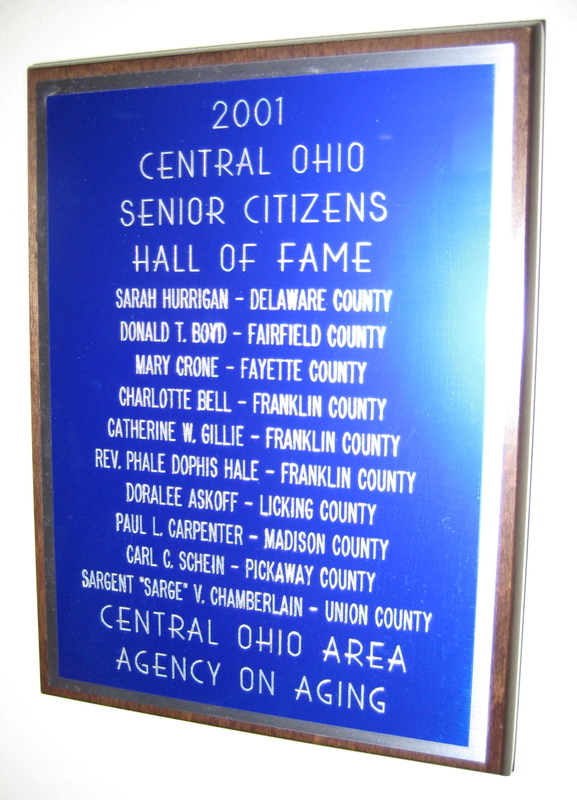 Hall of Fame Looking for Dynamic Central Ohioans Over Age 60. 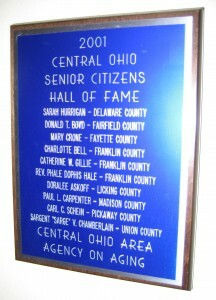 The Central Ohio Area Agency on Aging, COAAA, is currently seeking nominees for the 2012 Central Ohio Senior Citizens Hall of Fame. The next induction ceremony and reception will be held on Wednesday, May 16, in Columbus. Inductees receive a lapel pin, a framed portrait from a professional photographer, and a personal recognition on stage from county commissioners, followed by a catered reception with family and friends. We have nominated or helped nominate three people from Madison County for the Hall of Fame: Paul Carpenter, our former delivery driver and good friend (2001); Richard “The Captain” Murray, Christmas decorator extraordinaire and husband to Ann, who worked for the drugstore until this past May (2005); and Mary Mitchell, a lady who can do just about anything she sets her mind to (2008). If you know someone who is over the age of 60 and has made significant contributions to their community, COAAA wants to know about them. Any individual or organization may nominate a resident of Delaware, Fairfield, Fayette, Franklin, Licking, Madison, Pickaway, or Union County. The person must be 60 years of age or older and a legal resident of Ohio for the past five years. A married couple can also be nominated if they are both equally involved in the same activities and both meet the eligibility requirements. You can request a nomination form by contacting the Hall of Fame Coordinator for COAAA, at 614-645-7250 or 1-800-589-7277 or by emailing coaaa@coaaa.org. You can also download an application from the COAAA’s web site HERE. To find out more about the Hall of Fame, go HERE. The Deadline for nominations is February 20, 2012 (it has been extended from the original February 1 deadline). We can all breathe a sigh of relief. We are finally getting a traffic light at the intersection of Route 42 and West Avenue. According to the Marysville Journal-Tribune and an article in the Saturday, January 14 edition of The Plain City Advocate, the traffic light will be installed in 2014. The cost will be $500,000 with $400,000 being funded by the state. Plain City will have to pay the remaining $100,000. As anyone who lives in Plain City knows, the intersection at West Avenue and Route 42 has always been the location of many, many accidents. Traffic on 42 comes flying through the intersection and on some days it is nearly impossible to cross or get out on to the state route from West Avenue. Since I drive this route almost every day to go to the post office and the pharmacy, I am extremely glad to know that a light will be installed. We still have a few years to go, but at least now, we know it is coming. 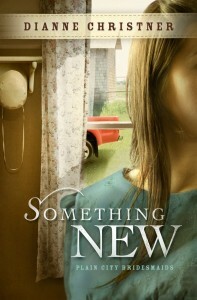 One day when I was waiting at the stop sign on West Avenue beside Der Dutchman, I witnessed a horrible accident. An older gentleman on a scooter tried to cross 42 and was hit by the tail end of a semi. He was thrown into the middle of Route 42, his scooter a crumpled mess. Luckily, he was okay, but a stoplight there would have prevented the accident completely. From the pharmacy, we can see the intersection and hear the sounds when a collision takes place. It is always cause for alarm when the echo of screeching brakes reaches us. 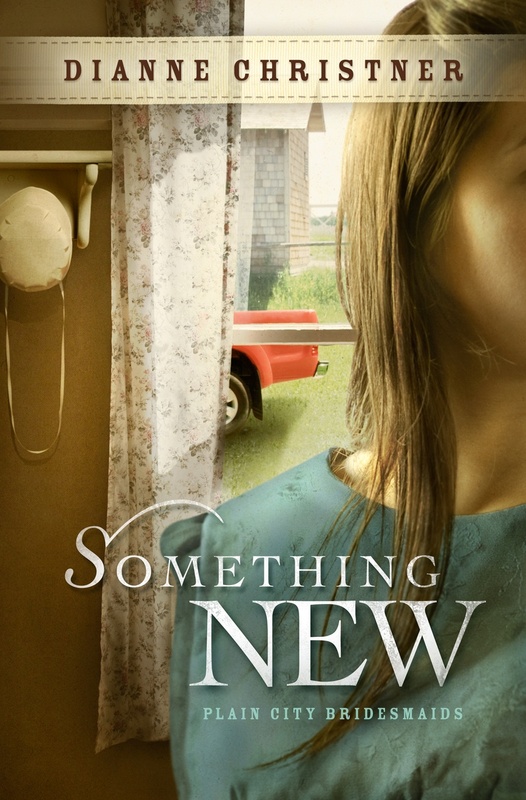 We always fear the worst–a death at that deadly intersection. Hopefully, everyone will continue to drive carefully until the traffic light is in place.